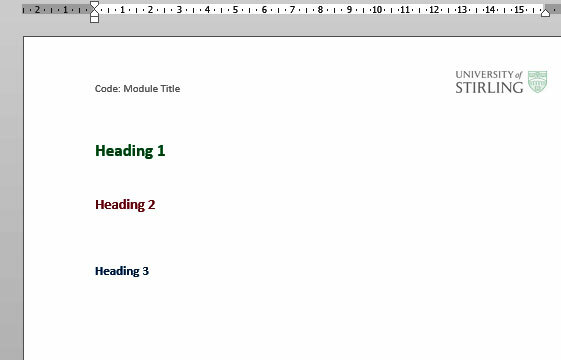 In this example, a bespoke Microsoft Word template was designed to support the subject leads and teaching staff involved in the delivery of the Work-based learning foundation apprenticeship programmes across the university. The template specification, including the branding, use of icons and heading styles, was determined through discussion at an initial workshop of subject leads. The guide builds on other available resources and focuses on using the built-in activity icons created by the EDU. Download an example template and the guide for this project. The Microsoft Word template designed for the nursing degree programme was developed through two highly productive scoping workshops. These workshops ensured that the final template encapsulated the requirements of the team including automatic logos, ALT text, standard iconography (with ALT text) and standardised headers and footer information. The final design supported effective navigation of learning content across the modules within the programme. The aim of the team was to enhance the student experience by providing easily accessible and navigable learning content within the virtual learning environment. All efforts have been made to ensure materials created by the EDU comply with current accessibility guidelines (JISC: Support for learners with disabilities). If further assistance is required with accessibility matters please contact the student support section in your academic partner UHI: Accessing learner support. We welcome any comments on how to improve this unit. Please feel free to pass these on at any time. your internet browser (you can check your browser version at: http://detectmybrowser.com/). UHI provides links to external sources of information and may refer to specific Web sites, products, processes or services within this resource. Such references are examples and are not endorsements and whilst every effort is taken to ensure the accuracy of information provided UHI is not responsible for any of the content or guidance. You are advised to exercise caution. Download a copy of this resource in PDF format. You can also print individual pages by printing directly from the browser.